The 2016-17 season was certainly an interesting one for Edmonton Oilers forward Tyler Pitlick. After years of seeing nothing more than the occasional cup of coffee in the NHL, the 31st pick of the 2010 Entry Draft finally earned himself a shot at proving he belonged at this level. To his credit, the youngster made the most of the opportunity but was once again derailed by injury. 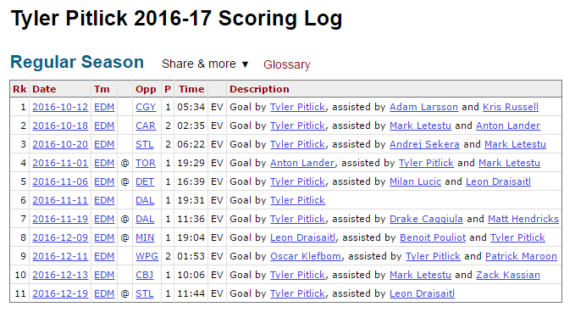 With Edmonton struggling to find any kind of secondary scoring at even strength early in the season, it was Pitlick who was lighting the lamp with some regularity. Eight goals, eleven points in 31 games and almost all of it was done playing bottom six minutes. Simply take a look at his scoring log below and you will see exactly who his linemates were and every point he scored came at even strength. 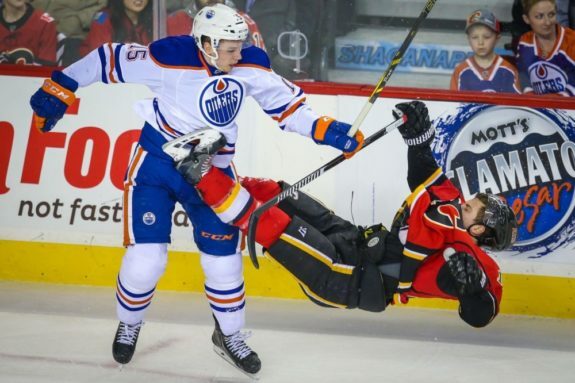 In fact, despite missing more than 60% of the Oilers games, the only players on the roster who found the back of the net more times than Pitlick did at 5-v-5 were Connor McDavid(26), Patrick Maroon(24), Leon Draisaitl(19), Jordan Eberle(16), Ryan Nugent-Hopkins(13), Milan Lucic(11) and Oscar Klefbom(9). Not too shabby for a guy who averaged less than ten minutes of ice a game and was viewed as nothing more than a fill-in/depth guy heading into training camp. His combination of speed, physicality, and finish was something this lineup had been missing from its third and fourth line for ages and his addition made the Oilers a tougher team to matchup against on a nightly basis. In the vast majority of his 31 appearances, the 25-year old did something to impact the game and that earned him a spot in Todd McLellan’s rotation. He was a welcome addition to be sure but in typical Pitlick fashion, it was only a matter of time before disaster struck. After opening the scoring for the Oilers during the first period of their December 19th tilt with the St. Louis Blues, a harmless looking collision with Jori Lehtera late in the second period produced a torn ACL in his left knee and just like that, his season was over. Oddly enough, it like felt like déjà vu. As it was back on October 26, 2013, when the youngster opened the scoring against the Phoenix Coyotes and was promptly knocked out of action late in the middle frame with you guessed it, a left knee injury, thanks to hip-check from defenceman David Schlemko. Just like this year, Pitlick was playing well and appeared headed in the right direction. He would not play again until March of 2014 that season but never managed to regain his form, whereas this time around he would not see the ice again. From a club perspective, the injury could not have come at worse time for the Oilers in 2016-17 but to their credit, the likes of Drake Caggiula and Anton Slepyshev made the most of the opportunity and found a place in this lineup over the final half season. A tough break for the Minnesota native but again, an all to familiar theme. Since being selected with the first pick of the second round in the 2010 draft, Pitlick has played a grand total of 254 games in pro hockey. Think about that for minute, in seven seasons he has averaged 36 games a season and a total of 58 with the Oilers. Year in and year out, it has been one injury after another and not surprisingly, it has greatly hindered his development. There is no question, he possess the skill set to be a contributor in this lineup moving forward but his history cannot be ignored. With a 19-year old Jesse Puljujarvi likely to earn a spot out of camp next fall and the aforementioned improvement in the overall games of both Caggiula and Slepyshev, the available spots on the wing are few and far between. 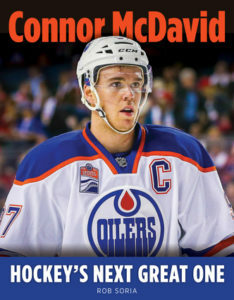 Would the Edmonton Oilers have interest in re-signing him to a team friendly deal, preferably of the two-way variety? Most certainly but from Tyler Pitlick’s perspective, with unrestricted free agency staring him squarely in the face, taking that next step in his NHL journey is all that matters…and doing so with a different organization would be in his best interest.